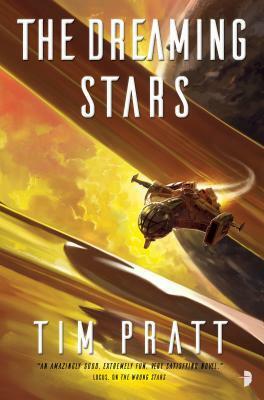 Tim Pratt’s The Wrong Stars was exactly the sort of book I was looking for — a fun space opera with some truly great aliens and queer protagonists. The Dreaming Stars is everything I could ask for from a sequel. However, if you haven’t read The Wrong Stars I suggest you go pick up a copy before diving into The Dreaming Stars. Also, this review will contain spoilers for the first book in the series. Humanity has no idea the danger it is in. An ancient alien race, the Axiom, ruled the entire universe. At the moment, they are sleeping, but if they are alerted to humanity’s existence, they will be sure to destroy us. The crew of the White Raven are the only humans that know the truth, and they believe that this is a chance to destroy the Axiom once and for all. Only, that’s easier said than done, giving that the Axiom are into casually destroying planets. Even while they sleep, they have some hellish defense mechanisms. Case in point, ships start to go missing out by a secret Axiom base, and the Liar sect in the area has gone totally silent. The crew of the White Raven is off to investigate, and what they find poses an imminent danger to all of humanity. The Dreaming Stars has lots of hints towards things that I think will be important later. Take Stephan’s church — how is it that they the visions they experience during their rituals are shared to such a degree? It’s not like they’re plugging their minds together… so are they really tapping into some underlying force? And what about the flashes of something Callie sees in the warp jumps? The existence of the Axiom may have been revealed, but I’m sure this series has more surprises in store for us. On a similar topic, I find the plotting deliciously twisty and always fun. In particular, the latter half of the novel contains a development that made me so happy! It was such a cool idea and executed so well. I’m definitely not forgetting The Dreaming Stars any time soon. The beginning of the novel might have been a bit slower, but wow does it pick up speed as it goes along. At about the halfway mark you start getting into mortal peril… and I got so excited that I literally started laughing? I guess I have odd reactions to characters I love being in danger, but this is a series I trust to carry me through it and not give me heartbreak. At the end of last book, Elena’s murderous ex Sebastian was put into a medically induced coma, after he tried to take over the entire galaxy. Elena has no intention of ever getting back together with him (besides, she’s with Callie now), but she hasn’t given up hope that whatever the Axiom machines did to his brain can be fixed and Sebastian can be restored to his old self. But how will they tell when Sebastian is “cured”? And how much of his behavior was due to the Axiom’s interference and how much of it was Sebastian himself? Like all the crew of the White Raven, you the reader have no idea whether or not you can trust him, and it sure keeps you on your toes. In my review of the last book, I mentioned that the romance between Elena and Callie did seem to happen very quickly. But for me, that wasn’t as much of an issue here, probably because they’re an established couple at the beginning of the novel. Also, there’s no forced, B.S. romance drama! The main reason I love this series is that it’s just so fun. It’s reliably fun. Sometimes, you need a book that you can trust to be truly and utterly fun, and that’s The Dreaming Stars. The Dreaming Stars proves that this series will always leave me with a smile.